Protocols abound, work awaits. You need efficient tools. That is why Vetoquinol offers you a one-stop, one-shop solution to your professional bovine reproduction needs. By providing you with highly efficient tools, we make sure that reproduction is never left to chance. In the heat of the moment, the right product given at the right time makes all the difference. Reach for the product you can always trust: Bioestrovet. Because your success is built on your commitment to excellence. Ours too. BioestrovetTM/MC is a synthetic analogue of prostaglandin (cloprostenol). Ask your veterinarian if Bioestrovet is indicated for your herd. Bioestrovet and Fertiline are a perfect combination for better management of the estrous cycle and breeding for cattle. • Bioestrovet is approved for IM injection in cattle. 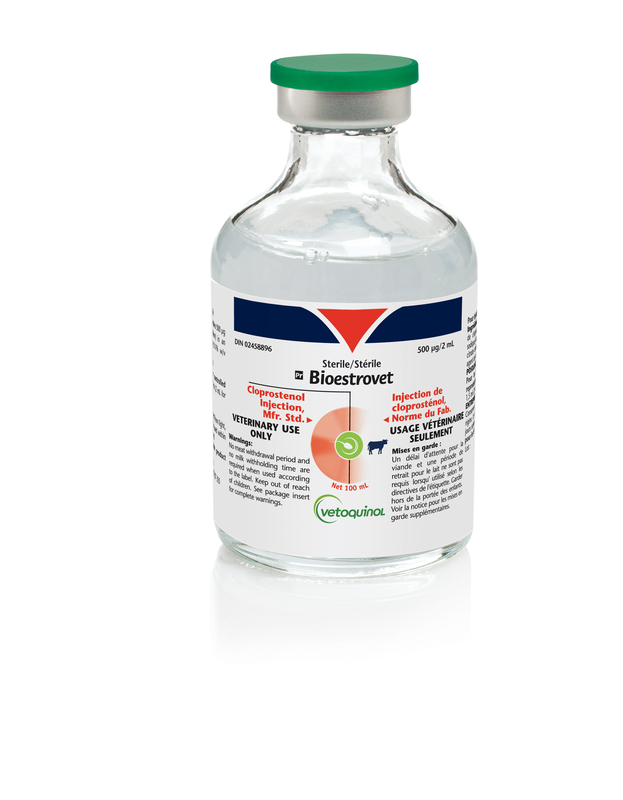 Bioestrovet contains 250 μg/mL of cloprostenol (as cloprostenol sodium), an analogue of prostaglandin F2α. Prescription drug. Use as directed by a veterinarian.